Pune-based business tycoon Suniel Mutha, chose the MGM Grand, Macau to host his son Sidaarrth’s traditional Jain Wedding. 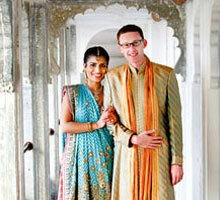 The celebration was managed by Ahmedabad-based Red Events, with decor inputs from Mumbai’s Gurleen Manchanda Puri. 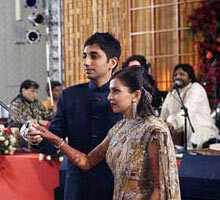 Pune-based business tycoon Suniel Mutha, chose the MGM Grand, Macau to host his son Sidaarrths traditional Jain Wedding. The celebration in July 2008 was managed by Ahmedabad-based Red Events, with decor inputs from Mumbais Gurleen Manchanda Puri. Suniel Mutha wanted to organise something spectacular for Sidaarrths marriage to Niyati Karia, a jewellery designer. It took eleven long months of planning to organise the grand celebration in Macau, the former Portugese enclave now a gambling mecca. In a newspaper interview Mutha was quoted as saying that he made made six trips to Macau, 60 kms from Hongkong to pick a venue and arrange the logistics. They also considered Turkey as a destination, but the difficult visa requirements discouraged them. Macau met their requirement of uniqueness and exclusivity and the grooms father paid for the wedding guests to fly commercial airlines to Macau; and the special wedding logos were printed even on the in-flight towels. Mutha settled on the MGM Grand, mostly because the hotel was willing to give the group full access to the kitchen that serves the ballroom. Since the Muthas are Jains, and a lot of elderly relatives were coming, they had to be picky and fastidious about every ingredient that went into making the lavish treat. MGM Grand in consultation with the catering company Ahmedabad-based Bhagwati group spent extensive time in training their staff on the food and other ceremony requirements, and handling special requests from elders. Interestingly, before the guests came in, they even sterilized the ballroom kitchen, to remove all traces of carnivorous Chinese feasts. Since most of the waiters didnt understand English or Indian food combinations, they came up with the idea of numbering the dishes so that the order would be according to the dish number. The Bhagwati group ended up carrying long ingredients and even kitchen utensils for 18 meal menus with no repeats, taking into account import laws and airline regulations. A total of 250 support staff who included the catering team, set decorators, choreographers, hairdressers and mehndi artists were flown in from India. The Muthas wanted the groom to arrive in an elephant, and since there was no elephant in Macau, they wanted to import one from India. But that was not permitted by the Macau authorities. Finally, the groom arrived on a horse. The tricky issue was the pheras around the fire‚ unlike many families who give this a miss, since its an issue with hotel authorities the Muthas wanted the traditional symbol there. So they had to sign contracts indemnifying the hotel against any damage or illness resulting from the fire or the cuisine!